A team led by researchers at the University of Colorado Boulder is studying data from NASA’s OSIRIS-REx spacecraft, which approached the big asteroid Bennu months ago. Their new study has revealed that the asteroid Bennu’s gravity is odd enough to make the sample extraction process extremely challenging. The new findings were reported by the team that works on NASA’s Origins, Spectral Interpretation, Resource Identification, Security-Regolith Explorer (OSIRIS-REx) mission. The data arrived only three months after the first encounter with the asteroid in the beginning of December. The asteroid Bennu measures as tall as the Empire State Building and poses a potential threat for Earth in the next century. NASA finds this asteroid particularly important because scientists believe its chemical composition may be similar to that of asteroids which brought carbon and other building blocks of life to Earth. OSIRIS-REx is orbiting the asteroid at a distance of about a mile, and the data scientists have recovered so far suggests that Bennu’s gravity is very wild, according to CU Boulder’s Daniel Scheeres, who is leading the radio science team for the mission. The new research published in the journal Nature Astronomy indicates that the big asteroid’s mass is about 73 billion kilograms. The data can also be used to determine Bennu’s gravitational pull. The researchers’ findings suggest Bennu is situated between two competing forces which give it a “wild spin.” Scheeres said in a statement that the asteroid completes a single revolution in four hours and that the forces which cause its wild gravity could be responsible for its evolution and eventual destruction. “When you spin this guy up, you create a competition between the gravity that’s holding you down and the centrifugal acceleration, which is trying to throw you off,” Scheeres said in a statement. The study also suggests the asteroid‘s equator is trapped in what scientists call a rotational Roche lobe, a feature that hasn’t been studied yet on an asteroid. 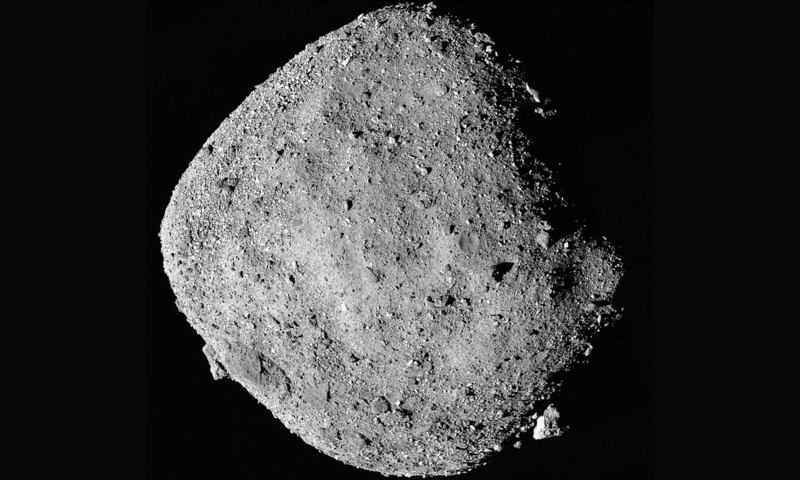 Scientists will have to learn more about this feature to understand the wild nature of the asteroid Bennu’s gravity. Scientists believe radiation from the sun is causing Bennu to spin faster and faster as time passes, and while the asteroid is speeding up, its Roche lobe feature is shrinking — along with the forces that hold it together. According to study co-author Jay McMahon, an assistant professor in aerospace engineering, understanding the asteroid Bennu’s gravity is important for future scientific missions. In 2020, scientists expect to use OSIRIS-REx to collect samples of material from the surface and send them back to Earth in a return capsule. Understanding Bennu’s gravitational properties is essential for the mission to be successful.